What do you do to make money when you have a limited set of skills? In this dark comedy the two central characters, who find themselves unexpectedly set free from a mysterious mental institution, are able to pack socks into boxes, and they can apologise. They can’t get work in the outside world doing the former, so they find themselves setting up in business apologising for people instead. In a world in which everything can be outsourced, when concierge companies can provide any service provided the price is right, why shouldn’t apologies be outsourced? In Kim Young-ha’s recent short story Ice Cream we meet someone from the customer services department of a big confectionary company, whose job it is to apologise to customers for faulty products. But in Lee Ki-ho’s dark world the faults which require the apology are much more personal: perhaps you want to apologise to a friend for eating the side dishes too fast in a shared meal; or a guilty husband might want to apologise for ditching his wife ten years ago. How much easier it is to get someone else to do it for you and avoid the embarrassment. In Kim Young-ha’s story the apology can be considered to be complete when the aggrieved customer accepts the expensive box of chocolates the apologiser brings with him in recompense. 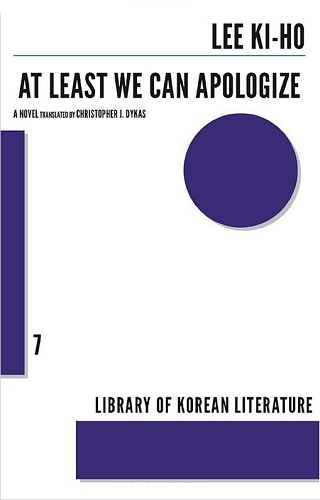 But in Lee Ki-ho’s novel, no apology can be considered to have been accepted unless the recipient of the apology punishes the apologiser. And the punishment is inevitably physical. 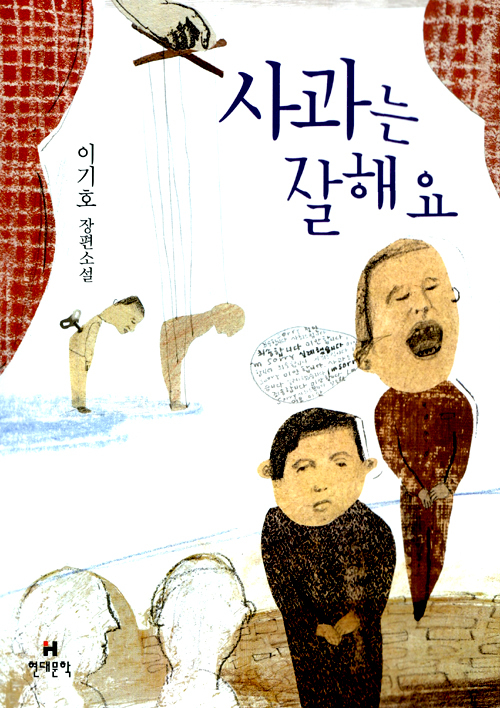 It is fortunate that the two central characters of this entertaining novel, Si-bong and the un-named narrator, have the physical resilience of a cartoon character or the star of a Korean gangster movie. They can be beaten to a pulp, seemingly be right as rain the next day, and not bear any grudge at all. In fact you can imagine this novel being turned into a movie by the director of Attack the Gas Station. Their expertise in apologising started for all the wrong reasons – the sadistic caretakers in the asylum habitually beat the inmates simply for pleasure, but nevertheless used to force them to confess to real or imagined wrongs for which these beatings were the punishment and absolution. The inmates then started actually committing the wrongs in order to justify the beatings. The beatings and apologies were all part of the same process by which the caretakers gratified their brutish desires. By virtue of their excellence in being beaten, our two heroes become appointed chief apologisers on behalf of the other inmates. Their first main assignment on the outside is one they market themselves, suggesting to the local butcher that they apologise on his behalf to his best friend and neighbour the greengrocer. Apologise for what? For hitting the shuttlecock too high in a game of badminton; for eating the banchan too fast during their shared lunch. And before long, the two best friends are at each other’s throats as they pick up on each other’s trifling wrongs. As former inmates in an asylum, Si-bong and the narrator are not geniuses. It is almost by accident that they find themselves in the outside world, having been talked in to assisting in an escape plan by another inmate. And when on the outside it is again a virtual stranger who crystallises the idea of the Apologising Agency. Despite their seemingly slow mental capacity, our heroes do have human insight. They are able correctly to identify that the butcher has reason to apologise to the greengrocer, even if they do not know what it actually is. And when it comes to getting someone else to make an apology they are unable to give, their operation goes like clockwork. But in general, none of the characters have any particular depth – from the sadistic caretakers (and masochistic director) in the asylum to the good-for-nothing lover of Si-bong’s prostitute sister, these are all two dimensional cartoon characters. But it is this lack of characterisation that throws into relief the interesting questions the book is asking – the nature of confession and forgiveness, and of the nature of today’s consumer society where any service can be intermediated or outsourced. “Why am I laughing at this?” you inevitably start to wonder. You’re not supposed to laugh at the disadvantaged. Because of our laughter, we almost don’t question why such an institution was allowed to exist, an institution where a parent can simply dump an inconvenient or awkward child, where staff can carry out beatings at will, and where inmates can mysteriously disappear. But maybe instead we should focus on the absurdity of the premise, of apologising for someone else. Lee pushes the idea and its moral consequences to its limits, with outcomes that are both humorous and tragic. The story leaves you wanting to know what happens to everyone next, and it’s a disappointment when the book has to end.